Darier disease, also known as keratosis follicularis, is an autosomal dominant genodermatosis that occurs as a result of mutation in the ATP2A2 gene, located on chromosome 12q23-24.1. It encodes the sarcoplasmic/endoplasmic reticulum Ca 2+-ATP isoform 2 protein, which is a calcium pump that transports calcium ions from the cytosol into the sarcoplasmic/endoplasmic reticulum, catalyzing the hydrolysis of adenosine triphosphate. 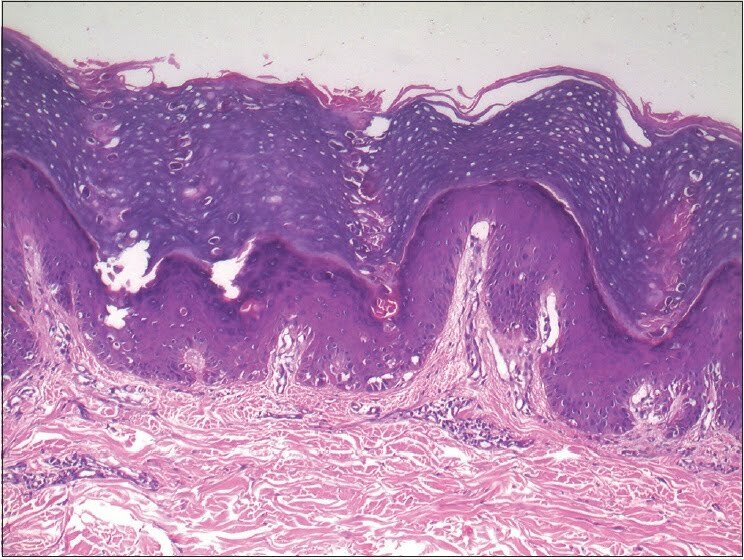 It is classically characterized by follicular and nonfollicular skin colored to reddish brown hyperkeratotic papules, primarily on the seborrheic areas, along with a cobblestone appearance of the buccal mucosa and white/red longitudinal bands on the nail plates that frequently end in V-shaped notching. Zosteriform or linear, cornifying, vesiculobullous, isolated acral hemorrhagic, acrokeratosis verruciformis of Hopf, comedonal and hypopigmented/leukodermic macules are its rare morphological variants. Sakhiya J, Virmani NC, Sharma YK, Khopkar U, Vellarikkal SK. Unilateral monomorphic hypopigmented macules: A variant of Darier disease. Indian J Dermatol Venereol Leprol (2017) Apr 29;83:369-71.